We got a big burst of media coverage for our Mapping Manchester exhibition on Wednesday and Thursday following a clever press release by the University's media officer. This got picked up by the Manchester Evening News and the Guardian, who did an interview with my colleague Chris Perkins. 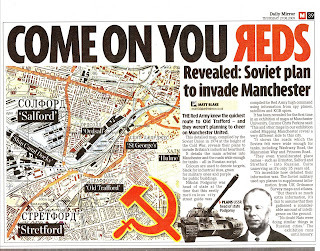 The next day rehashed stories appeared in many of the papers, including The Mirror. The highlight was an interview with Chris in the 'and finally' slot of the News at 10. The Russians are denying the validity of the story, claiming the map is a fake. 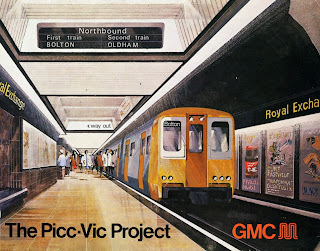 Another couple of examples from the 'Public Transport' display cabinet in our 'Mapping Manchester' exhibition. 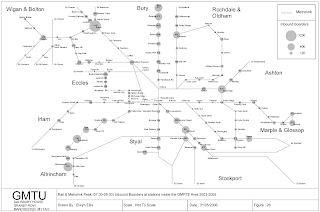 Network map detailing rail passenger statistics by station. 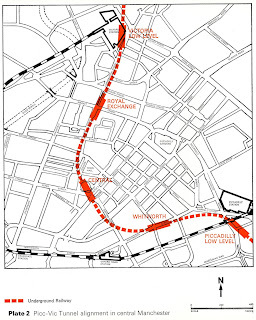 local significance of public transport to the city.